A few weeks ago I purchased my first product from Lush. 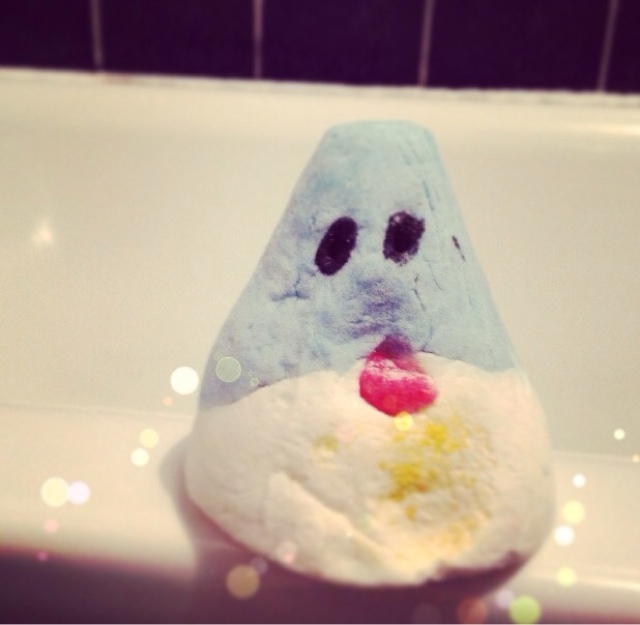 I continually hear about how amazing their bath stuff is, and I always wanted to try it for myself, so I finally sauntered into Westfield and bought myself a bath bar - The Christmas Penguin. As soon as I walked into the shop, various aromas hit my nose and I wanted to smell almost everything, especially the bath bombs. The Christmas themed ones caught my eye, as I know they are incredibly popular this time of year. A shop assistant came to help me - he was very enthusiastic and recommended The Christmas Penguin for my first Lush venture. The website tells me that the Penguin is modelled on those found on Philip Island, Australia and are the smallest Penguins in the world! The featured ingredient is Sicilian Lemon Oil, which made it smell really fresh- perfect for a bathtime treat. I crumbled it under hot water and used it over two baths. For £2.95 I was relaxed beyond belief, my skin felt smooth and I had fun watching the water turn blue (I'm such a child). This certainly won't be my last Lush purchase! Never tried lush products before! I guess I should start now! I am obsessed with lush products! My all time favourite being their Christmas shower gel called 'Ponche' it has orange and tequila in it and it smells divine!! 100% recommend going into lush and giving it a sniff! I haven't tried this one but I've bought it for my sister for Christmas as she loves Penguins haha. I hope she likes it too!